Available in two different grades of stainless steel: 316 and 304. Both are offered by Trinity Sling in cut lengths or as part of an assembly with other stainless-steel attachments. 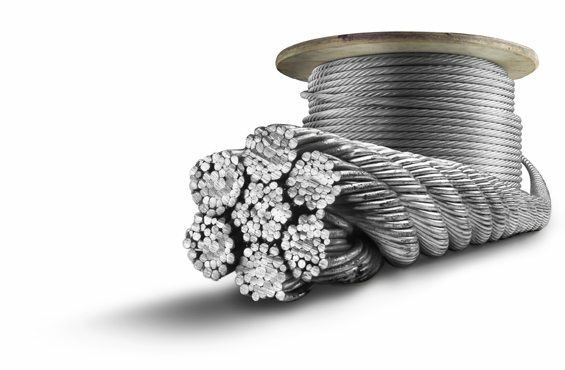 Stainless steel cable comes in 7×19-style wire rope up to 3/8” and 6×19-style for larger sizes. The 7×19 stainless steel rope is often called aircraft cable, but common 7×19 stainless cable should NOT be used in aircraft applications; specially-rated rope is required. Stainless steel rope is excellent for wet applications or where appearance is important. 1/8 1,760 lbs. .029 lbs. 3/16 3,700 lbs. .065 lbs. 1/4 6,400 lbs. .110 lbs. 5/16 9,000 lbs. .173 lbs.